Gord from Foghorn Fishing got a guest into a nice salmon yesterday. The lucky angler is Bill, all the way from Australia. 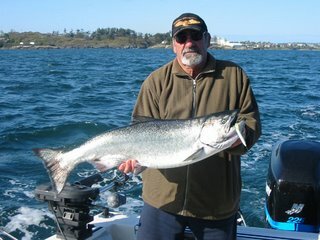 He caught this big winter spring off the Victoria waterfront...a hatchery salmon, so it's a keeper! Gord reports: "salmon fishing has slowed down a bit but there is still fish out there". As the saying goes, the only certain thing about fishing is you won't catch anything if you don't go...so get out there and enjoy some time on the water.